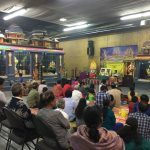 GOD Satsang families in Toronto were blessed with a beautiful discourse series on Srimad Bhagavatam by Sri Poornimaji from October 12-17 2017 at Sri Siva Sathyanarayana Temple in Mississauga, Canada. 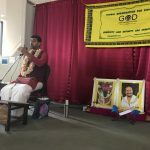 Day 1 of Sri.Poornimajis program started with the 30-minute Abhang and Sri Guruji kirtans on Lord Vittal by Toronto GOD members. This was followed by Sri Poornimaji’s discourse. 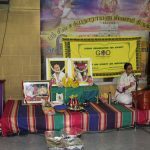 Poornima ji did a re-cap of the Bagavatha Mahtmayam from last year and also re-iterated that Bagavatham is Bhagavan to the audience. She nicely prepared the audience like how Sage Shuka prepared King Parikshit for Canto-10 of Srimad Bagavatham. Day 2 started off with 30-minute kirtan of Krishna which included few of Guruji’s kirtans “Kuzhaloodi Vandanane” and “Eppadi Kettaal “as well. This was followed by Poornimaji’s talk. 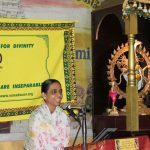 Poornima ji beautifully explained how Bhagavan comes in the form that a Bhaktha thinks of. She took the audience through the short description of Canto 9. 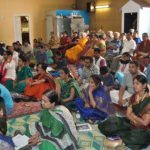 Like how Parikshit was waiting for Krishna Katha, She brought out the importance of how a listener should be ready to listen to Krishna Katha. 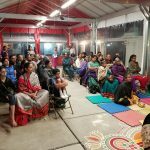 Day 3 commenced with the beautiful exposition of Poornima ji explaining in detail, how Bhagavan chose to be born to Vasudeva and Devaki , and how how all the devas came down to earth to enjoy the Leela of Bhagavan in Krishna Avatar. Poornima ji through her talk, took the audience to Dwapara yuga, to the land of Mathura to witness the Krishna Jananam . 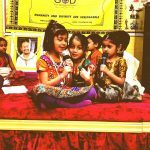 Day 4 began with the Toronto Gopakuteeram children presenting a Play on ‘Krishna Leela’. Children beautifully enacted the four leelas where Yashoda sees the universe in Krishna’s mouth, Damodara Leela, Kalinga Narthanam and Govardhan Leela. Following the play, Poornima ji’s pravachan started with Gokula Leela. She explained about the Gopis of Gokul were very happy in welcoming Lord Krishna and Nadotsavam was celebrated. Pootana moksham was explained beautifully by Poornima ji that the audience were immersed in the leela. Day 5 – On the 5th day, Poornima ji , explained the two other beautiful bala leela of Lord Krishna. This included the Shakatasura and Trinavarta Vadham. 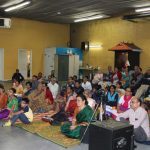 Day 6- The sixth and the final day of Poornima ji Discourse series of Krishna leela came to a grand closing by Toronto GOD members signing few of Madhuragitams. This is followed by Poornimaji talk on Rukmini Vivah in a very detail manner.After the discourse series, Kalyana Ashtapadi was sung. The chariot was decorated with Guru Maharaj and Divine couple and the chariot was pulled around the temple with all the devotees chanting the Mahamantram with total enthusiasm and devotion. 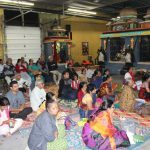 Toronto GOD satsang members are deeply grateful to the blessings of Guru Maharaj and our humble pranams at Guruji’s Lotus feet and pray for more and more satsangs. Around 50+ people participated in the event on all the days.